Today John is at the office working so dinner is in my hands. No surprise that it is meatless! Dinner tonight consists of Lebanese tabbouleh and chickpeas with olive oil and cracked juniper berries on mixed greens plus a tomato and cucumber salad. I added some feta to my salad but if you omit the feta, the dinner is totally vegan. This is a no-cook dinner perfect for a hot (and smoky) summer night. 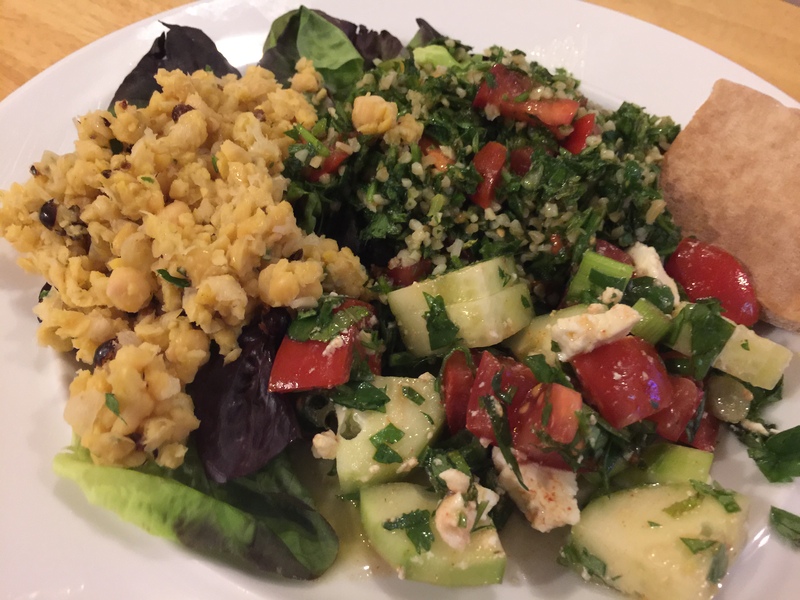 This entry was posted in Grains, Legumes, Mediterranean, Vegan, Vegetables, Vegetarian and tagged chickpeas, cucumbers, feta, juniper berries, tabbouleh, tomatoes. Bookmark the permalink.